It's big. 85-inches of HDTV is about to come your way and knock you down. This Ultra High Definition TV is what Samsung is showing the world today at CES. With an unique industrial design that reminds one of a drawing board, it is suspended off the ground and can tilt up and down, is the UN85S9. While it may have an ugly name, let me reassure you that the ugly stops there. 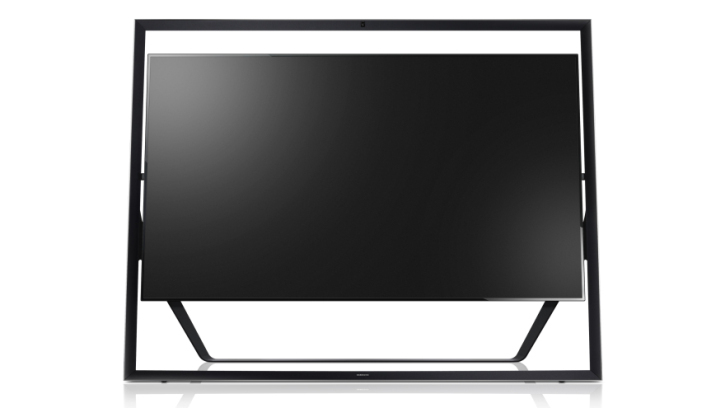 As if it is floating in the midair, Samsung's behemoth will be one heck of a display to have in your living room, granted your living room is even big enough to house this beast. Along with the TV comes a 2.2 speaker system that borders the display itself. Unfortunately, 4K resolution will not be coming with Samsung. Instead, they will be focusing on upscaling 1080p content to fit the Ultra HD standards. For the UN85S9, this is done through a 1.35 GHz quad-core A15 processor. There is yet to be any information on pricing but Samsung plans to release the UN85S9 sometime in March.